I woke up on Christmas eve with a plan of action beginning with working on my laptop. As we only have HSDPA at home I decided to work until 9am. I took my coffee with me to my desk and did what I could upstairs while I waited for the internet to catch up with me. At 9am I got ready to shower and as I turned the water on, it turned off. So I put on my costume, had a swim and collected water from the tap at the bottom of the garden. This became my regular walk for the day, from the kitchen to the bottom of the property. As we live at the foot of a mountain, the gravity pushes water through the pipe, to our tap. I boiled the kettle endlessly to keep my hands clean while I cooked the turkey for our Christmas lunch. In between all of this I made dessert for Christmas eve dinner, rushed down to the shops for tin foil, flowers and cleaning wipes. I cleaned the guest bathroom as best as I could for our house guests and left for the airport to fetch my parents without having showered. Thankfully by the time we got back, the water was on and I could run the dishwasher. I set the washing machine to run at 7am Christmas morning and could finally wash my hands under running water. It’s amazing how we take this for granted when so many people around the world live without this luxury. To go with the turkey I served the cranberry sauce I made as part of my Ball® review. It’s thick and sticky and went perfectly well with the meal. Wow! This looks so nice and sounds lovely with Christmas lunch! Also, I agree, it’s amazing what we take for granted. We’re so blessed! Happy 2016!! Your cranberry sauce sounds much better than the tinned one I use. 🙂 I must try this. And yes, I totally agree, we really are VERY lucky to have running water. Your cranberry sauce looks amazing. I’m craving for a turkey sandwich with cranberry sauce right now. Cranberry sauce is perfect to be eaten on freshly baked baguettes. Mniam! That is something I can try for sure! Hi Tandy, I bought extra cranverries and froze them like Sue from the great island recommened, will be making this for sure sounds amazing!!! Happy New Year to you and your husband!!!! What a wonderful cranberry sauce! Have a lovely New Year! 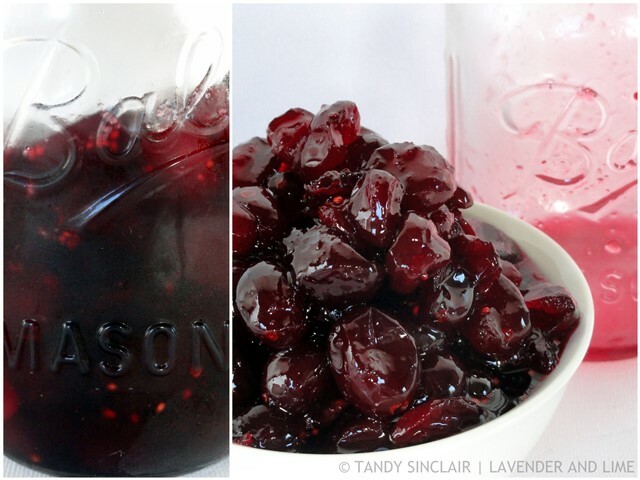 I’m stockpiling cranberries in the freezer so I can make this all year long! Wishing you all the best in this new year, Tandy. Thank you for this Tandy! I have loads of frozen cranberries in the freezer and was in two minds wether to make cranberry sauce this sunday for (yet another!) roast dinner or if to make a cake….after reading this recipe I think im going to go ahead with the sauce. Yum! This cranberry looks most excellent, you make it look so easy Tandy! !